Well, it looks like the score is Publicity 1, Moviegoers 0. Seeing the absolutely hilarious trailer for "Comedian", I was immediately interested; not only do you see inside the creative world of comedians, but one of them is Jerry Seinfeld! Now I know why no footage from the film was shown in the trailer. "Comedian" follows the creative process of two comedians. One is Jerry Seinfeld, who was at the top of his game a few years ago, having his own hit TV show and a terrific standup routine. When we see him in "Comedian", it is after his show's run has ended, and he wants to do what no sane comedian with his level of success would do: create an entirely new routine. The other comedian is Orny Adams, a young and (supposedly) up and coming comedian, who is struggling to get into the limelight; he is sure that he is a talent yet to be discovered. Maybe comedy is a serious business, but the process of coming up with it doesn't translate well onto the big screen. One can easily appreciate the effort that goes into it; but what is onscreen does not move beyond interesting; we are never particularly compelled. There's a lot of discussion between some very famous comedians that I felt an insider would appreciate more than the casual viewer. This goes for the film as a whole as well. Its intent is to show the general public how hard it is to be a comedian, but I would much rather read a book on the subject; even at a mere 82 minutes the film gets tiresome. I guess the fact that the film isn't particularly funny is beside the point. Orny Adams doesn't exactly help the audience out in that respect. To be fair, Adams is trying hard. But throughout the entire film, he proves himself to be one of the most obnoxious, self-important people wanting to break into show business. He continually whines about how he is an undiscovered talent, about how no one really ever sees what he's got. He always blames the audience for not laughing, but it never really occurs to him that his material just might not be funny. 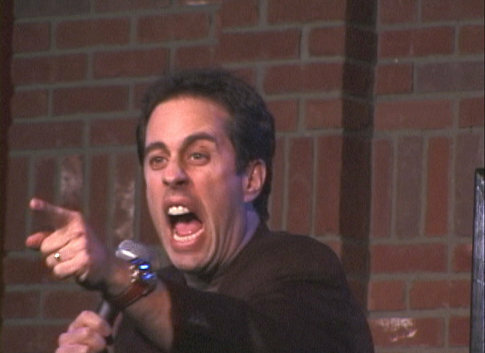 Later in the film, Seinfeld states that "people can blame it on the candles or something in the room, but really, if you're not funny, you're not funny". This is advice Adams might be able to take, if he was one to take advice at all; instead, he thinks all pieces of advice are attacks. It's unfortunate, because Adams has a wealth of very intelligent comedians that he can reach who know what they're doing; if only he would listen. I'm not sure who it was that decided that following around such a cocky subject would be a good idea for a documentary, but it doesn't work. As much as director Christian Charles can cut quickly between interviews, standup footage, and musical montages, he can never really keep us engrossed in the world of the comedian. Yes, it is an interesting topic, and it is something I might want to know more about sometime, but it isn't exactly good food for film. If you wish to know about comedy, find a good biography or something in that vein, but unless you are very serious about the business, "Comedian" is not the way to go. "Comedian" is rated R for language.